The students start and run their own businesses as part of the Merit curriculum. Each student does market research to select a business to start during the school year. They write their Business Plan. After completing their Business and Marketing Plans, they will write a cover letter summarizing their intent. Next, they seek financing. Each student runs their own business in order to give the students a well-rounded perspective on business. This way, each student has the opportunity to work in sales, marketing, accounting, customer service, and manufacturing (if applicable). Weekly business meetings with their business advisor help the students to stay focused so they reach their goals. Students write a flow chart to organize the complete operation of their businesses. They discuss possible problems and set policies to ensure success. To improve customer service and internal operations, the students create forms and checklists. Merit Academy offers a unique opportunity for students to write books for publication. Under the guidance of the business advisor or English teacher, the students select topics, do market research, organize outlines, and write books. This course offers students the opportunity to write books for publication as part of the Merit curriculum. After completing one year of Introduction to Business Honors in the 6th grade, the students will be prepared to publish and market their books at the end of 7th grade. Merit Academy offers a unique opportunity for students to write and publish books. Under the guidance of a business advisor, students spend the year preparing their books for publication. After completing one year of business in the 6th grade and writing a book in the 7th grade, Merit Academy students will be prepared to forge ahead in the publishing world. By exploring the many publishing options, the students makes educated decisions about how best to publish their books. They first market their books to small and large book publishers across the United States. Next they explore on-demand book publishers. And then they consider e-books. By filing their books with the Copyright Office in Washington DC or with their publishers, the students protect their work. By targeting niche markets, students prepare a marketing plan to sell their books. This course is designed to provide the students with a formal study of grammar. Students consistently refine their journalistic skills, in order to understand the importance of revision in the writing process. The course also focuses on building vocabulary using common words and understanding their Latin and Greek roots. The students engage in Kumon English exercises to improve reading comprehension and vocabulary. They also participate in the Speed Reader program to increase reading speed and fluency, as well as comprehension. ENG 810H-830H will focus on grammar skills and writing mechanics. The students will review parts of speech and special grammar functions such as verb phrases, articles, modifiers, and subject-verb agreement. Students will practice using and recognizing parts of speech through various class exercises and writing assignments. 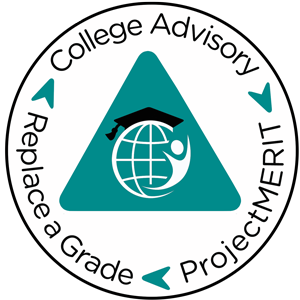 Using high school and college-preparatory texts, the students will learn grammar, writing mechanics, and word-usage skills to prepare for Merit Academy’s rigorous high school English program. The students should be able to clearly identify and label structural features of complex sentences and build upon these to advance individual writing skills. To hone in on the students’ journalism writing and newspaper layout skills, the students will write articles and do layout exercises to reinforce new concepts. They will write news, editorial, and feature articles, and they will learn how to develop the context and style of the articles as well as the newspaper layout. This two-year course provides an in-depth, exciting examination of the various historical, cultural, and economic developments that took place around the world during the Renaissance Period (1450-1779). Although Renaissance history typically centers around the “rebirth” in European cultures, in the 6th and 7th grades at Merit Academy, the students explore all of the cultural, scientific, economic, and political changes that took place around the world during this exciting 200-year period. The Scientific Revolution, the Reformation, the Exploration, and the Renaissance are only part of the awakening that took place in the world. Japan celebrated individualism, China exchanged products and knowledge, Africa and South America provided resources, and throughout the world new contacts and exchanges encouraged change. Political arguments, military engagements, and economic booms and crises are only a part of the story. This two-year course provides an in-depth, exciting examination of the various historical, cultural, and economic developments that took place around the world during the Renaissance Period (1450-1779). Although Renaissance history typically centers around the “rebirth” in European cultures, in the 6th and 7th grades at Merit Academy, the students explore all of the cultural, scientific, economic, and political changes that took place around the world during this exciting 200-year period. The students will focus on the Exploration and the Enlightenment during the 7th grade. Political arguments, military engagements, and economic booms and crises are only a part of the story. Group influences, individuals of character (or notoriety), and emerging philosophies will be evaluated as well. This class requires lectures, assigned reading, in-class discussions, tests and quizzes, timeline and map creation, class presentations, field trips, and 3 major research papers. This course focuses on the major turning points that changed the world after the Renaissance: 1714-1914. The students will examine the rise of democratic ideas and look back at the historical roots of current world issues. During the fall trimester, the students will study Impressionism, Colonial Expansion, and the Revolutions of England, America, and France; winter trimester, Industrial Revolution and Inventions; and spring trimester, Industrial Revolution and Nationalism. The students will extrapolate from America’s short history that democratic ideals are often achieved at a high price, continue to be vulnerable, and are not respected or practiced everywhere in the world. The students will write three major research papers over the course of the school year. This class will also travel to England to visit the birthplace of the Industrial Revolution: Iron Bridge Gorge to fully realize the changes that occurred during this time period. This course is the first part of a two-year Renaissance Literature (6th and 7th grades) course. The students will read 35 classic Renaissance works of literature during this 3-trimester period (71 for the entire 2-year course). Students will come away from this course with a foundation in the development and impact of literature on culture and society of the Renaissance Era. Memorization and writing will convince the students of the beauty and difficulty of literature of this time. Lectures will guide and inform the student in the development and personalities present, and movies will illustrate and reinforce their new found information. Their understanding of its history and development will be heightened, and they will also be able to put the works in historical and cultural context. This course is the second part of a two-year Renaissance Literature (6th and 7th grades) course. The students will read 36 classic Renaissance works of literature during this 3-trimester period (71 for the entire 2-year course). Students will come away from this course with a foundation in the development and impact of literature on culture and society of the Renaissance Era. Memorization and writing will convince the students of the beauty and difficulty of literature of this time. Lectures will guide and inform the student in the development and personalities present, and movies will illustrate and reinforce their new found information. Their understanding of its history and development will be heightened, and they will also be able to put the works in historical and cultural context. This course follows a 2-year intensive Renaissance literature program. The students will read 36 classic novels that focus on mood, romanticism, Realism, and the movement toward modernity during this 3-trimester period. The students will travel to Great Britain on an English Literary Tour with their Literature teacher. They will visit the homes and museums of English writers (Shakespeare, Bronte, Dickens, Austen, Keats, Wordsworth, etc.). Students will come away from this course with a depth of perception about human motivation and value. The program will include lectures about authors, their times, impact and the changes in literature of the era. Students will participate in discussions, write critical analyses, memorize and recite quotations, and present speeches. These skills are invaluable to their understanding of the literary milieu. The students’ understanding of life and human interaction will be enhanced; they will also be able to put the works in historical and cultural context. This three-trimester 6th grade honors pre-algebra course will prepare students to take Introduction to Algebra with confidence. This course has three main components: math fundamentals, problem solving, and Kumon Math. In order to maximize the students’ exposure to each new concept, the students are required to complete all problems in each section. In addition to one-to-one instruction in math concepts, the students also do Kumon Math, which offers the students the opportunity to master mathematic areas where they may be weak to ensure success as they work their way to calculus. The students also tackle problem solving and logic problems to apply their math skills and to think critically. This three-trimester Introductory Algebra course will prepare students to take Algebra 1 with confidence. This course will has three main components: algebra concepts, problem solving, and basic skills. In order to maximize the students’ exposure to each new concept, the students are required to complete All problems in each section. In addition to one-to-one instruction in algebraic concepts, the students also do Kumon Math, which offers the students the opportunity to master mathematic areas where they may be weak to ensure success as they work their way to calculus. The students also tackle problem solving and logic problems to apply their math skills and to think critically. This three-trimester Algebra 1 course is an extension of the comprehensive Pre-algebra course offered in 7th grade at Merit Academy. This course consists of three main components: algebra concepts, problem solving, and basic skills. In order to maximize the students’ exposure to each new concept, the students are required to complete all problems in each section. In addition to one-to-one instruction in algebraic concepts, the students also do Kumon Math, which offers the students the opportunity to master mathematic areas where they may be weak to ensure success as they work their way to calculus. The students also tackle problem solving and logic problems to apply their math skills and to think critically. Success in calculus requires a solid algebra foundation. 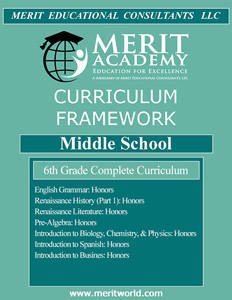 In sixth grade at Merit Academy, the students are introduced to the foundation sciences: biology, chemistry, and physics. During the fall trimester, the students will study biology; winter trimester, chemistry; and spring trimester, physics. The purpose of this introduction is to prepare the students for the human physiology course which is offered in 7th grade at Merit Academy. College-level courses in biology, chemistry, and physics will be taken in high school. This full-year course is designed to introduce students to human physiology. They will learn about the function of each system as well as the physiology of how each system works. The students will participate in dissections and they’ll observe the dissection of a human cadaver. They will watch Professor Anthony Goodman’s videos to receive a college lecture and observe other dissections. One of the unique aspects of Merit Academy’s physiology class is the seminars given by local physicians following each system studied. By the end of the year, students will have a comprehensive understanding of how their bodies work and what they need to do to nourish and maintain them. This full-year course is designed to prepare the students to take Merit’s high school Introduction to Chemistry course. By studying chemistry at the high school level during 8th grade, the students will have a good foundation for entry into a high school introductory Chemistry course. By the end of the academic year, the students should have a good understanding of introductory chemistry concepts. This full-year course is a continuation of the 5th grade Spanish class, and is designed to introduce the students to Spanish vocabulary, grammar, and conversation. The students write weekly journal entries. Cooking classes, presentations, and daily dialogue introduce students to the world of the Spanish language. Weekly vocabulary and grammar quizzes reinforce a strong foundation that the students will need when entering Merit Academy’s intensive Spanish 1-4 program in high school. This full-year course is a continuation of the 6th grade Spanish class, and is designed to introduce the students to Spanish vocabulary, grammar, and conversation. The students write weekly journal entries, bi-weekly essays, and embark upon their first research paper in the spring trimester. Cooking classes, presentations, and daily dialogue introduce students to the world of the Spanish language. Weekly vocabulary and grammar quizzes reinforce a strong foundation that the students will need when entering Merit Academy’s intensive Spanish 1-4 program in high school. This full-year course is a continuation of the 7th grade Spanish class, and is designed to introduce the students to Spanish vocabulary, grammar, and conversation. The students write weekly journals, essays, and research papers. Cooking classes, writing to Spanish-speaking pen-pal, presentations, and daily dialogue introduce students to the world of Spanish. Weekly vocabulary and Spanish grammar quizzes reinforce a strong foundation that the students will need when entering Merit Academy High School’s intensive Spanish 1-4 program. At the end of the year, the students will travel to Costa Rica or Argentina to use the Spanish-language skills they have learned in middle school.